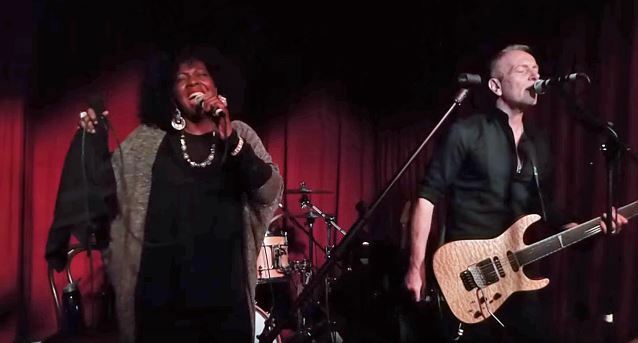 Fan-filmed video footage of DELTA DEEP's March 29 performance at Ortlieb's in Philadelphia, Pennsylvania can be seen below. DELTA DEEP is the critically acclaimed blues-based band featuring Phil Collen (lead guitarist of DEF LEPPARD) and Robert DeLeo (bassist for STONE TEMPLE PILOTS), in addition to Debbi Blackwell-Cook (back-up vocalist for such artists as Michael Buble and Gregory Hines) and Forrest Robinson (drummer for India.Arie, Joe Sample & THE CRUSADERS, TLC). DELTA DEEP is touring in support of its live album, featuring songs recorded during the inaugural January "Sugar Shack" West Coast run. The January trek featured sold-out shows, with fans and critics alike raving about the band's live show. Collen initially started DELTA DEEP in 2012 after jamming at home over the course of a year with friend and relative Debbi Blackwell-Cook (Blackwell-Cook is the godmother of Collen's wife, Helen). What started as a casual pairing singing Motown and classic blues staples while Debbi frequently visited Collen's home quickly turned into much more. Collen, Helen and Debbi began writing original music which Collen and Debbi recorded in Collen's home studio. Later that year, a chance meeting re-acquainted Collen with Memphis native and enigmatic heavy metal, jazz, and R&B drummer Forrest Robinson. A friend suggested giving STP bassist Robert DeLeo a call. Sharing a loving affinity for soul, funk and the blues, DeLeo was the perfect fit. According to Collen: "We really wanted Robert in this band. He had the added firepower of being the premiere pioneer and most 'badass bass player' to come out of the alternative rock explosion."